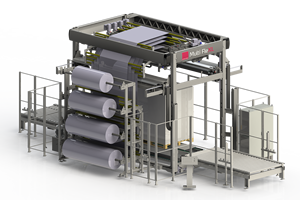 The Multi FleXL is a stretch hood stretch wrapper that is designed to be able of wrapping larger pallet loads. This machine uses a stretch hood technology that is used to go over the top of the pallet and completely cover it from the top to the bottom. It is very similar to putting an air tight bag over the pallet to cover the entire pallet. The wrapping machine is a heavy duty option.